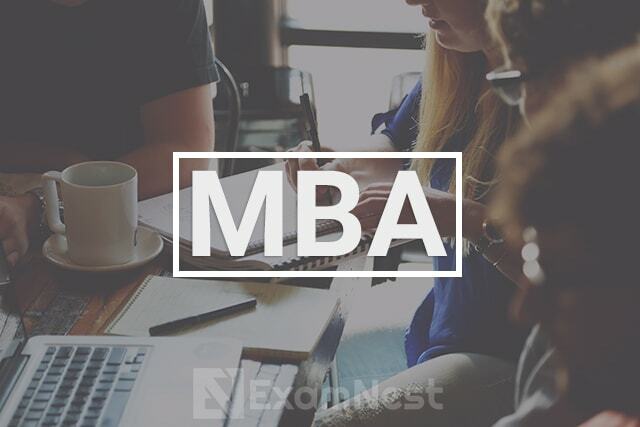 The following MBA entrance exams are gateways to top MBA colleges. CAT Exam (Common Admission Test) is a computer based MBA entrance exam conducted by the Indian Institutes of Management (IIMs). The test is conducted every year by one of the IIMs at rotational basis. The CAT score is considered for admission by most of the top B-schools across India apart from IIMs.According to the IIM admission criteria, candidates appearing for CAT must have a Bachelor’s Degree with at least 50 per cent marks (for General category) and 45 Percent (for SC, ST and PWD category) or equivalent CGPA from any recognised university.It is important to know that the admission criteria of each IIM is independent to mandate their own eligibility criteria including CAT score, academic cut-off, past academic performance, relevant work experience etc. How can ExamNest help you? We impart you with knowledge delivered by faculties holding years of experience who not only give you in depth awareness of your topics but also equip you with necessary tricks required for competitive exams like CAT. We provide you with separate CAT mock tests which come under our mock test series and are directed towards getting you familiar with the CAT pattern and to self evaluate your performance with each successive mock test. We provide you with video solutions for all the mock tests so as to assist you with answers of the questions you couldn’t attempt. We would always be available for you on our discussion forum where you can clear your doubts and queries by getting in touch with us personally. We would be glad to support you. On regular basis you will be provided with essay topics so as to improve your writing section for later process of selection where you would give WAT. These essays would help you work on your grammar and formation. For later stages of selection which includes PI, the personal interview we would help you by guiding your way through and sharing experiences of other interviewees. Our site would be updated every week with current affairs which would capacitate you for in prompt topics during GD, WAT, PI. Our receptive outlook towards news would keep you up to date with limelighted issues throughout the World. We help you prepare for Campus Recruitment Training (CRT) which is exclusively designed for the students preparing for recruitment and is geared towards ensuring that the students are well equipped to get through the recruitment process of various IT and NON-IT companies. We aim at making you experience classroom education wherever you are so that you may lag behind due to any distinct reason. Our study material would be available for you on our site to be accessible at any time to facilitate your preparation. Our complete set which includes the mock test series, the video lectures, the news updates and video solutions is focused on being very economical so that we could benefit more and more aspirants in need of support at this platform. Indian Institute of Foreign Trade conducts its national level post-graduation MBA entrance exam, known as IIFT. The test is conducted for admissions to its MBA in International Business program at two of its campuses- IIFT Delhi and Kolkata. The aspiring candidates must have a full time i.e. 3 years graduation degree in any discipline and it should be from a recognized university or institute.The candidates will be selected on the basis of the following: Written test, Essay Writing, Group Discussion and Personal Interview. We provide you with special mock tests designed specifically by our experienced faculties to make you practise for IIFT. Conducting weekly tests to check your performance. Study material on General awareness and video lectures on English, Mathematics, Logical Reasoning would be available on our site for you to access anytime. Our video lectures cover topics in great depths so as to make you experience classroom education wherever you are. XAT stands for Xavier Aptitude Test. It is an MBA entrance exam conducted by XAMI (Xavier Association of Management Institutes), to select candidates for admission to management institutes. Apart from XLRI (Xavier Labor Relation Institute), the Xavier Aptitude Test score is accepted by some of the top B- Schools in India. a candidate is eligible to appear in XAT, if he/she holds recognised Bachelor’s Degree with minimum 3 years duration or equivalent in any discipline. Each participating institute will have its own XAT cutoff. The qualifying candidates will then be selected for Group discussion, Personal Interview and Essay Writing. Not every institute conducts all three rounds. We provide you with special mock tests designed specifically by our experienced faculties to make you practise for XAT. Conducting weekly tests to check your performance. Our video lectures cover topics in great depths so as to make you experience classroom education wherever you are. Our aim is to reach to those who cannot reach us. We’d provide you with essay topics regularly and help you work through your essay writing. As XAT has a strict section focusing on your writing skills that would be necessary for you to get into XLRI. Symbiosis National Aptitude (SNAP) Test is a national-level MBA entrance examination, conducted by Symbiosis International Deemed University (SIU). Eligibility for this exam is Graduation in any discipline with at least 50% marks from recognised university or institute. After the cut-off is declared for SNAP shortlisted candidates have to appear for the second round, including Group Discussion (GD), Writing Ability Test (WAT) and Personal Interview (PI) rounds. We provide you with special mock tests designed specifically by our experienced faculties to make you practise for SNAP. Conducting weekly tests to check your performance. We help you through your preparation by our video lectures which make you learn all your topics in depth and we divide our video lectures so as to make it easier for you to grasp easily. We would provide you with study material that would assist you in improving your General Awareness, we’d update you with latest news on Regional, Economic, National, International limelighted issues. Our discussion forum is always open for all your queries so as to solve them and get in touch with our tutors. We would gladly give you personal attention and support. The NMAT is also known as NMIMS Management Aptitude Test which is conducted on National level as an MBA entrance exam.The GMAC is also known as Graduate Management Admission Council and it is the conducting authority of NMAT. Today the NMAT is accepted by leading institutions and the list is growing. Pursuing a management degree at one of such universities makes the pursuit of your dreams much easier. The candidates should have the bachelor’s degree in any discipline from any recognized university and should be passed with at least 50% score in the aggregate graduation degree. If a candidate is able to clear the cutoff of a particular NMAT by participating institute, then he/she will be shortlisted to appear for Group Discussion (GD) or Writing Ability Test (WAT) or Case Discussion (CD) and Personal Interview (PI) rounds. We have a separate set of NMAT mock tests under our mock test series which covers all the other exams as well. They would get you familiar with the NMAT pattern and make you practise on a regular basis as tests would be updated weekly. Being a speed based test, it would require a lot of practise which would be rendered by our NMAT mock tests. We would get you proficient in all the topics under Mathematics, Logical Reasoning, English with are video lectures which cover them in depth with great efficiency. We would be there on our discussion forum to help you out with all your queries and doubts. You should feel free to approach us as we aim on bringing you the facility of classroom education at this platform. Common Management Admission Test (CMAT) is a national-level computer-based MBA entrance exam. The test is conducted by All India Council of Technical Education (AICTE). The eligibility criteria for CMAT is that the Applicant must be a citizen of India and must have a bachelor’s degree of a minimum three-year duration from any discipline. After the shortlisting of students based on their CMAT scores, candidate would appear in the various rounds of Group discussion(GD), Personal Interview(PI) and Written Ability Test(WAT). We provide you with separate mock tests for CMAT which come under our mock test series and would help you get familiar with the exam pattern and help you solve the questions with greater ease by making you assess yourself against time. We provide you with video lectures on every subject included in the CMAT syllabus which would help you learn all your topics with great ease and comfort. We also provide you with study material on the subjects which are Mathematics, Logical reasoning, English (this would include comprehensions, grammar, vocabulary) and on General Knowledge. Our study material on General Knowledge and our news updates would help you stay up to date even for your interviews, as group discussions also revolve around National and International matters. You would be guided by the best faculties and would have our support through the discussion forum where you can get in touch with us and clear all your queries. Management Aptitude Test (MAT) is a national level MBA entrance exam, conducted quarterly by the All India Management Association (AIMA). MAT is conducted in the month of February, May, September and December. To be eligible for MAT Applicants must be graduates in any discipline from a recognized institute or university. First, candidates are shortlisted on the basis of their MAT score and then there are Group Discussion, Written Test and Personal Interview. We provide you with special mock tests designed specifically by our experienced faculties to make you practise for MAT. Conducting weekly tests to check your performance. We give you solutions for all the mock test as well which clears all your doubts revolving around the solutions of the questions which gives you a new set of questions to practise. We will provide you with essay writing topics and conduct group discussions regularly so as to help you through the later process of selection which is as necessary as the former preparations. Our video lectures would cover the subjects included in MAT i.e, Mathematics, Logical Reasoning, General Knowledge, English with great efficiency so as to make it easy for you to grasp. Maharashtra Common Entrance Test (MAH-CET) is a computer-based MBA entrance exam. Officially known as MAH-MBA/MMS-CET, the exam is conducted by the Directorate of Technical Education, Maharashtra, for admission to management courses such as MBA/MMS in various institutes in the state of Maharashtra. Aspirants must have a bachelor’s degree in any discipline from any recognised university with a minimum of 50% marks, and at least 45% in case of reserved candidates. Our site provides you with video lectures on each of the subjects coming in the MAH CET which are Logical reasoning(includes Abstract Reasoning as well), Mathematics, English(includes reading comprehensions,vocabulary, etc.) Video lectures cover all the subjects with great depth to help you learn better. We provide you with separate mock tests for MAH CET which come under our mock test series and they make you practise your topics better and make you assess yourself improvement on a regular basis. We provide you with solutions for all the mock tests of MAH CET so as to make you grasp the solutions for questions you found perplexing. We provide you with support through our discussion forum as well where you can place all your doubts and queries and have personal attention from us.